Based on the unique fish fauna observed from a manned submersible on a southern Caribbean reef system in Curaçao, Smithsonian explorers defined a new ocean-life zone, the rariphotic, between 130 and 309 meters (about 400 to 1,000 feet) below the surface. The rariphotic occurs just below a previously defined reef zone, the mesophotic, which extends from about 40 to as deep as 150 meters (about 120-450 feet). The role of this new zone as a refuge for shallower reef fishes seeking relief from warming surface waters or deteriorating coral reefs is still unclear. The initial motivation for studying deep-reef ecosystems was the declining health of shallow reefs. Many researchers wonder if deeper reef areas, sometimes known as the "coral reef twilight zone," might act as refuges for shallow-water organisms. As the Smithsonian researchers sought to answer this question, it became clear to them that scientists have only scratched the surface when it comes to understanding the biodiversity of reef fishes. "It's estimated that 95 percent of the livable space on our planet is in the ocean," said Carole Baldwin, curator of fishes at the Smithsonian's National Museum of Natural History, lead author of the study and director of the Smithsonian's Deep Reef Observation Project (DROP). "Yet only a fraction of that space has been explored. That's understandable for areas that are thousands of miles offshore and miles deep. But tropical deep reefs are just below popular, highly studied shallow reefs–essentially our own back yards. And tropical deep reefs are not barren landscapes on the deep ocean floor: they are highly diverse ecosystems that warrant further study. We hope that by naming the deep-reef rariphotic zone, we'll draw attention to the need to continue to explore deep reefs." The authors defined the rariphotic based on depth observations of about 4,500 fishes representing 71 species during approximately 80 submersible dives to as deep as 309 meters. Most of the fishes in the rariphotic zone not only look similar to shallow reef fishes (photos) but are related to them rather than to true deep-ocean fishes, which belong to quite different branches of the evolutionary tree. This research showed that assemblages of the kinds of reef-fishes that inhabit shallow water in fact have double the depth range they were previously thought to have. Since 2011, when DROP began, more than 40 researchers, most from the National Museum of Natural History and the Smithsonian Tropical Research Institute (STRI), have intensively studied deep-reef fishes and invertebrates off Curaçao. They named six new genera and about 30 new species as they explored a 0.2 square kilometer (0.08 square mile) area of reef, much of which is too deep for enough light to penetrate to support the algal symbionts on which reef-building corals rely. 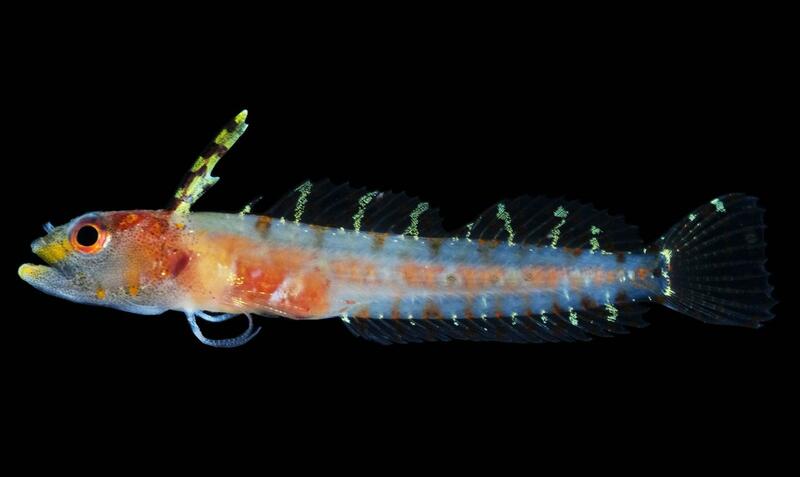 "About one in every five fish we're finding in the rariphotic of the Caribbean is a new species," said D. Ross Robertson, marine biologist at STRI and a co-author of the study. "So far, my favorite is Haptoclinus dropi" (see photo). It was named by Baldwin and Robertson in 2013 for the Smithsonian's DROP research project. Many more new species already discovered by DROP researchers await description. While SCUBA divers can work down to about 40 meters (120 feet), the Curasub mini-submarine plunges to 309 meters (about 1,000 feet), where it can stay submerged for up to eight hours at normal atmospheric pressure, enabling the passengers to simply step ashore after a dive. This technology has significantly extended scientists' ability to explore deep reefs. Altiphotic (high light): The new name for the previously unnamed 0-40 meters (0-120 feet), the well-lit zone where reef corals are abundant, which extends as deep as conventional scuba divers normally go. Mesophotic (medium light): 40 to as deep as 150 meters (120-450 feet), the maximum depth at which tropical reef-building corals and their algal symbionts can survive. Rariphotic (low light): Newly discovered faunal zone from 130-300 meters (400-1,000 feet), below the reef-building coral zone, and as deep as Curasub can go. "Reef ecosystems just below the mesophotic are globally underexplored, and the conventional view based on the few studies that mention them was that mesophotic ecosystems transition directly into those of the deep sea," Baldwin said. "Our study reveals a previously unrecognized zone comprising reef vs. deep-sea fishes that links mesophotic and deep-sea ecosystems." Research was supported by the Smithsonian's Consortium for Understanding and Sustaining a Biodiverse Planet, Competitive Grants for the Promotion of Science, National Museum of Natural History Research Programs, the Herbert R. and Evelyn Axelrod Endowment Fund for systematic ichthyology and the Smithsonian Tropical Research Institute, National Geographic Society's Committee for Research and Exploration (Grant #9102-12) and the Prince Albert II of Monaco Foundation (Grant #1801). Reference: Baldwin, C.C., Tornabene, L. and Robertson, D.R. 2018. Below the Mesophotic. Scientific Reports (a publication of Nature.com).